If you have read our LuxeCarib: The Lavish Lifestyle Guide to Luxury in Antigua, you know why we love Antigua. Pristine white-sand beaches, 365, one for every day of the year, make Antigua one of the most beautiful islands in the Caribbean. The exquisite coral-ringed island is the largest in the country. Boasting beautiful year-round weather, breathtaking scenery, warm and welcoming hosts and enticing cuisine, so much is packed into a tiny 108 square miles. Set between the Caribbean Sea and the North Atlantic in the West Indies, Antigua is the perfect place for a destination wedding. 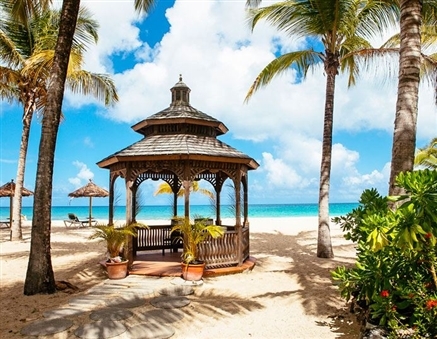 The romantic backdrop of shimmering blue water, opulent white sand and gorgeous beachfront gazebos of Galley Bay Resort makes for an unforgettable wedding day. Imagine the wedding photos in that setting. Galley Bay offers one-of-a-kind wedding packages with island luxury with memories to last a lifetime. But planning a destination wedding can be daunting. The thought of planning the most special day of your life from thousands of miles away is scary. But The Tropical Travelers, working closely with the major resorts like Galley Bay, can handle every detail for you. Destination weddings are our specialty and we can take the burden of planning off you and allow you to just focus on each other. Unlike a traditional wedding, where people gather only for a few hours, a destination wedding brings loved ones together for longer periods of time in a setting that’s like no other. Sharing this beautiful island and life-changing experience with your closest friends and relatives is simply incredible, and it’s even better when you can make it all happen without any stress. 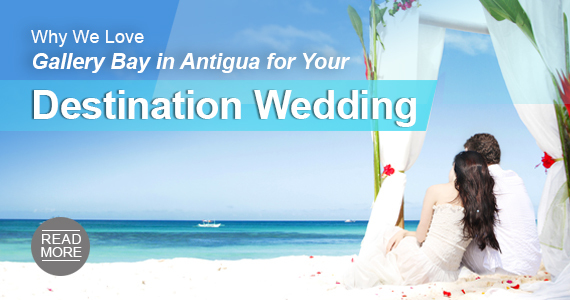 The best thing of all about having your destination wedding in Antigua is that you and your spouse can return for anniversaries, vow renewals and just to relive the incredible time you had while becoming man and wife. Having your wedding at Galley Bay in Antigua gives you the perfect excuse to return again and again–not that you needed one!